When using different fillings for several models using the "Per Model Settings" tool, sometimes it does not place the filling inside the piece. For example, in the following image you can see how the configuration is to have 80% fill, 60% fill and 10% fill. In the first case I don't place any filling, in the next case, but not in the 10%. In this other example, make changes not so abrupt and reaching 40% I found this error again. This does not happen if I put this percentage without using "Per Model Settings", besides that I do the same in version 3.6 and I do not find this error. I don't know if with other "Per Model Settings" options have the same problem, but I would recommend reviewing them. Greetings and I look forward to version 4.1. 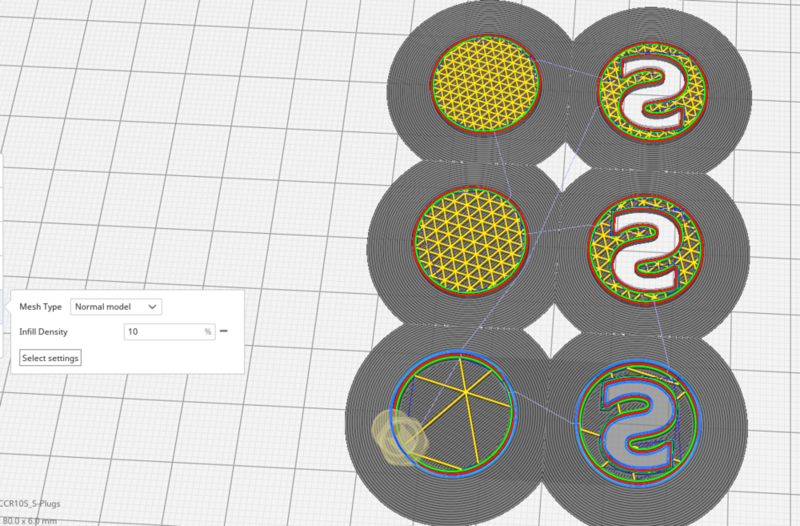 Hello @ArturoToons, I have tried slicing your project using a Cura based on the current development version and it doesn't show the problem you report. I also tried with infill densities of 80, 60 and 10 and that's good too. One oddity I noticed is that changing the infill density for a model doesn't change the blue button back to the slice button, you have to change something else in the main settings also.